With yet another weekend of shattered attendances and prize-pool records, it might just be safe to say that poker isn’t just alive and kicking, but growing and flourishing. The two days of pulsating, non-stop poker action that is the LWPS has simply whizzed by in a flurry of coolers, some truly dazzling skill, and the nastiest bad beats this side of the southern hemisphere. The weekend saw tons of laughter as usual, lubricated by the free flow beer at the venue. Like wine and cheese, poker just seems better with beer. For the first time in 6 Seasons, the players managed to finish the entire consignment, a feat organisers hope will be repeated in the immediate future. Which is not to say beer is always all fun and games. The end of Flight 1B was sadly marred by a ‘sports injury’. A player who’d been having a few was hustling back to his table to make First Card Out, when he jammed his knee into an unidentified inanimate object. To his credit, the player gamely finished Flight 1B among the chip leaders, but had to be wheel-chaired back to his room. You just can’t keep a winner down. We wish him a speedy recovery, and hope the sting of embarrassment has subsided. In a scenario swiftly becoming the norm at the LWPS, the long snaking registration queues and alternates list meant that even the added capacity wasn’t able to meet demand. After the dust had settled at the end of both flights, a total of 240 runners had ponied up the entrance fee, and the LWPS had achieved another milestone. The riveting and often exhausting battles of each Day 1 flight eventually saw 60 worthy runners start Day 2, with the overnight chip-leaders consolidated in a tightly-knit bunch. Several LWPS champions were still in the hunt, all looking to become only the 2nd repeat winner in LWPS history. Among them were Aaron Lam, the swashbuckling Ho Bao Qiang, veteran Liew Kok Kong, and defending champion Chua Koon Yuan. The first three levels of Day 2 saw a flood of eliminations, with the ordinarily rock-solid pocket kings proving the downfall of no less than 6 players before the bubble burst. It didn’t seem to matter how bad the contesting hand was. Pocket Kings simply wasn’t able to outrun any two cards on the day. In quick succession, it was bested by QQ, JJ, JK and A4, sweeping in its wake the title aspirations of its beleaguered players. 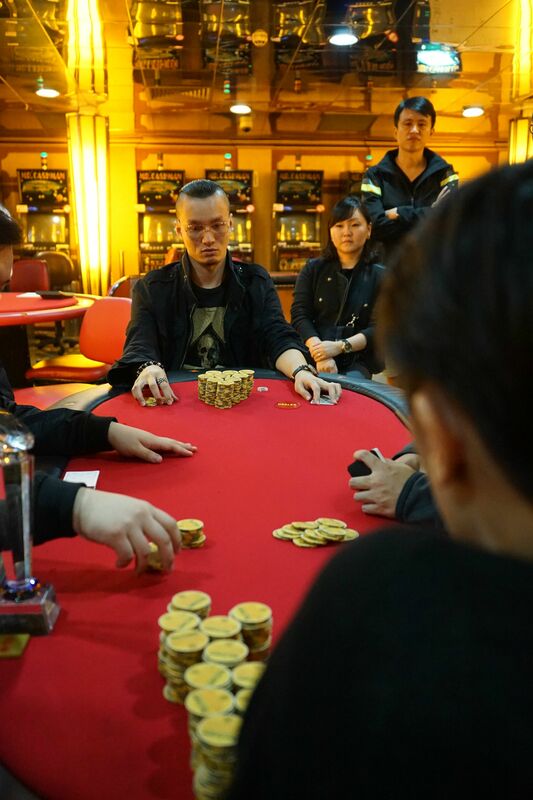 The last to fall victim to this cruel fate was Liew Kok Kong, whose KK was beaten by Paul Khoo’s rivered straight, consigning the former to the final table bubble. His exit meant LWPS XIII would not see another repeat champion, with Aaron Lam and Freddy Kwek having fallen several spots prior. The exuberant Ash Tay was multi-tabling both the main and side-event, and doing very decently in both. He was in with a decent shot of becoming the first player to have won both tournaments. Unfortunately, he was first to exit the final table when, severely short, his Qd8d fell to JdTd. Winston Koh, who’d done an excellent job navigating his way through a tough field to the final table, got the lot in with 88 on a J 5 7 board. Anton Wijaya however, flipped open JK for top pair, which managed to hold its lead to the river, sending Winston to the rails. Barely several hands later, Anton was at it again. 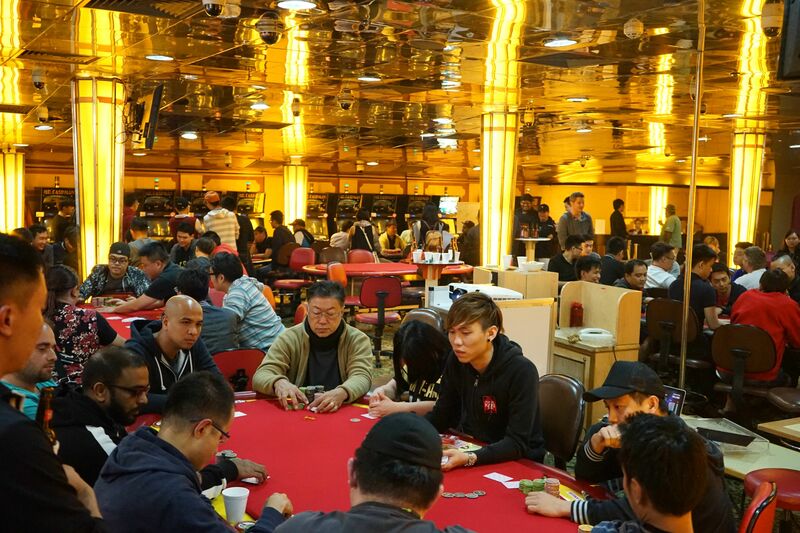 The only player with experience at an LWPS final table was beginning to pick up some momentum, and he duly applied pressure in Ivan Soh’s direction. Ivan, sensing the occasion to make his stand, got all his chips into the middle with 88. 88 however, simply wasn’t a hand that was going to beat Anton today, his AQ disposing of Ivan handily. Ong Ding Xiang was next to fall at the final table. Ding Xiang, who’d been nursing a short stack all day, was having a bad run of it. Card dead and spot dead for the longest time, he was finally forced to get it in with A8 pre-flop. He had the double whammy of running into one of the big stacks, who had enough chips to make the call with JT. A T on the flop left Ding Xiang drawing to three outs, and an 8 on the river proved insufficient to keep Ding Xiang in the tournament. He finished a very creditable 6th place. A massive pot then transpired several hands later, which altered the complexion of the final table. 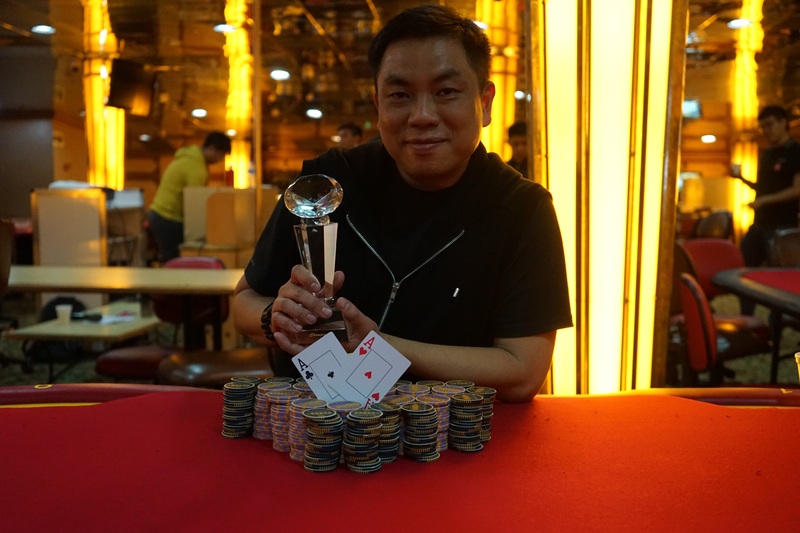 Paul Khoo had been enjoying a hitherto unstoppable march, until he found himself all-in preflop with AT against Anton Wijaya’s QQ. The queens held and Paul found himself crippled, with Anton’s massive stack to his immediate left. He quickly got the rest of it in not long after with A5, and was facing Alan Chua’s A8 for his tournament life. A 5 on the flop seemed to offer a reprieve, until a cruel backdoor flush sealed his fate, and an exit in 5th position. Also finding life tough at the final table was Vijay Visvalingam. Having weaved and dodged his way to the final table without ever seeming to have much chips, Vijay watched as the other players knocked each other about, nudging him higher and higher up the prize ladder. He then found what was a fairly routine shoving spot when play was folded to him in the small blind, and with K7 in the hole he duly attacked. John Low in the big blind however, had enough chips at this point to bail out Greece, and having quickly run the numbers, made the call with 87. Things were looking bright for Vijay when he caught two kings on the flop. The turn however, brought John an improbable flush draw. The poker Gods then dealt Vijay the cruellest blow yet by rivering the flush. As the expression goes, the crowd went wild. Kudos to the affable Vijay, who turns in his best ever LWPS showing at 4th position. 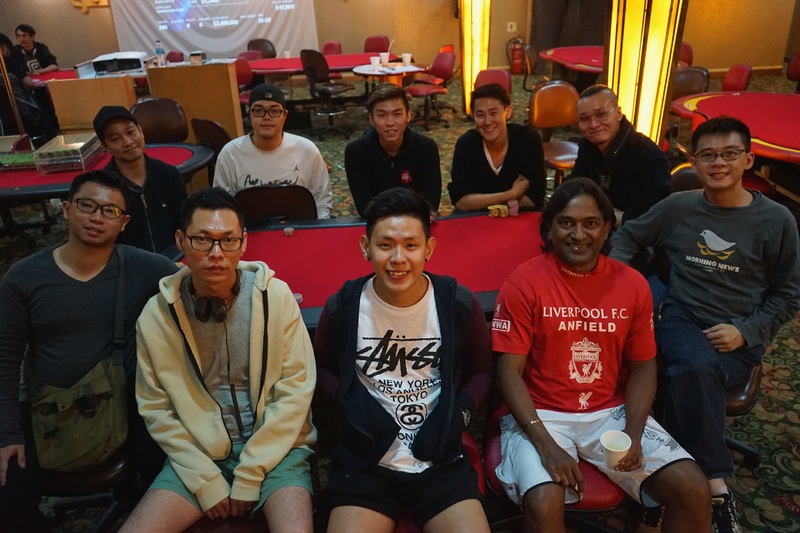 It was here, at 3-handed play that Alan Chua sprung into action after a largely quite final table for him. Sensing a need to put a dent or two into the big stacks, he took down four hands in a row to signal that he wasn’t just here to make up the numbers. Having diminished the chip leads Anton and John had over him, he looked in prime position to make a meaningful impact on proceedings. He was duly assisted by Anton and John, who shortly after got into what would prove to be the pivotal hand for the championship. On a board of 7 6 5, both players got the lot in, with John flashing J6 for middle pair, and Anton a dominating T7. The turn brought a J and the river a solid brick, and within seconds Anton’s potential championship winning chip lead evaporated into elimination. A cruel twist for the tough Anton, who at this point was the bookmakers’ even money favourite. Heads-up play saw both Alan and John determined to scoop the championship trophy and the top prize. John, who’d been confusing and overwhelming his opponents all weekend with his penchant for defusing positional advantage by checking in the dark, seemed to have the better of the initial exchanges with some post flop aggression, which Alan quickly adjusted to. Play continued this way for some time, with neither player able to establish a greater than a 1.4:1 chip advantage. The ostensible swing hand came when John managed to flop quads and still extract two streets of value. Alan declined to pay off one more street, saving his own tournament life, while John soared to a 4:1 chip lead. Down but not dismayed, Alan found a big double through with A5 shortly after, restoring some parity to the chip counts. The parry and thrust continued, until Alan decided to leverage on his cautious image by 3-bet bluffing with 87. John wasn’t having any of it and made the call with JQ. He instantly spiked a Q on the flop to leave Alan in serious trouble. When the turn brought no help to Alan, the crown was sealed for John Low, who becomes the LWPS XXIII Main Event Champion. Congratulations to both players on a superb finish! 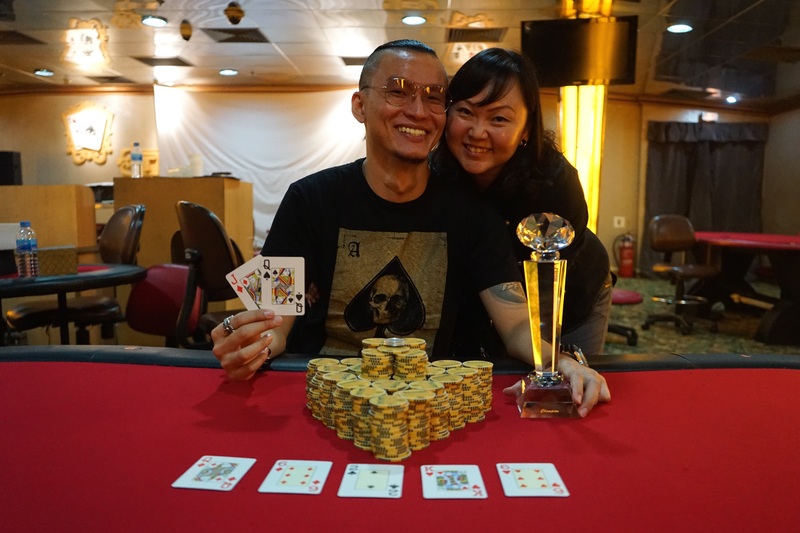 The Leisure World Poker Series congratulates all winners, and thanks all participants for making LWPS XXIII the record-breaking instalment it was. Join us when we set sail again in September!